How to invest in pro poor agricultural development in Africa and beyond. The president of the International Fund for Agricultural Development will visit UMB August 25th. The president of the International Fund for Agricultural Development (IFAD), Dr Kanayo Nwanze, claims that, by focusing on farming, Africa has the potential to feed not only itself but the rest of the world. Read more in a blog in the newspaper The Guardian. 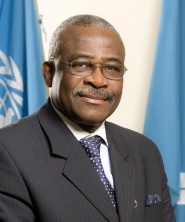 Dr Kanayo Nwanze, president of IFAD, will visit UMB August 25th and give an open lecture in BT1A from 12.30 to 14.00.